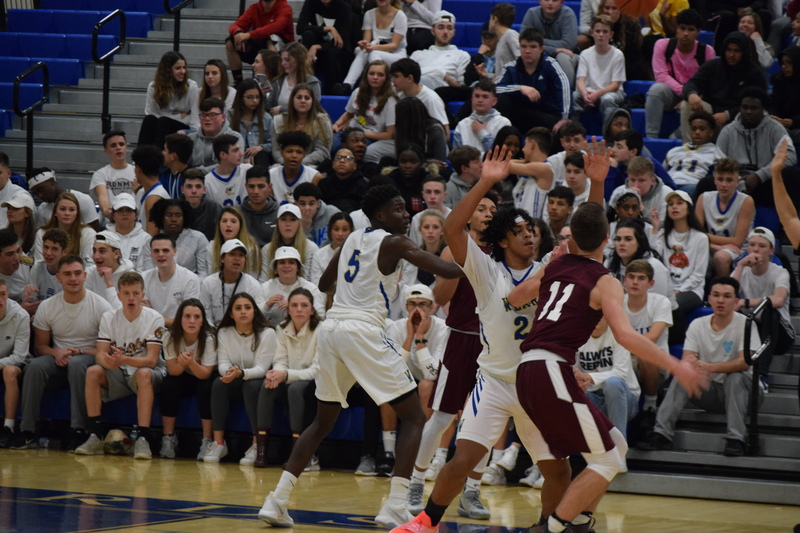 WASHINGTONVILLE — Washingtonville junior guard Ryan Graham hit two of the biggest shots in his varsity career in the Wizards 60-55 win over defending Class A Champion New Paltz Monday night. Graham hit 2 three-pointers in 21 seconds to erase a six-point deficit late in the fourth quarter. What most people don’t know is the work he put into his jumpshot throughout game-day. He set his alarm at 5:30 a.m. on Monday morning. While most students at Washingtonville were still sleeping, Graham gathered his basketball shoes and school materials, and left for a 6:20 a.m. shoot-around at the high school. He took about 100 shots and went to his first class at 7:30 a.m. The buzz around the school was electric throughout the day. After school was finished, Graham went directly to GymRatz Performance Center in Florida, NY for another round of shooting. At GymRatz, he took 318 three-point shots in 30 minutes and made over 50% of them. When he told his teammates about the shots he took before gameday, most of them were in disbelief. They asked him sarcastically if his arms would fall off during the game. He laughed and shrugged it off. They weren’t being sarcastic when he hit two of the most important shots of the game. He was greeted by hugs and high-fives as he got to the bench. He finished with 14 points, 4 rebounds & 4 assists. It was a defensive struggle in the first half as New Paltz held onto a 27-25 halftime lead. The Huguenots extended their lead to 43-37 at the end of the third quarter after two shots in the last minute from senior guard Casey Burke. Washingtonville (1-0) trailed by as many as nine in the fourth quarter after New Paltz started running a full-court press. The Wizards turned to junior center Romeo Aquino and senior forward Kareem Lubin for some offensive help in the quarter. Aquino grabbed four offensive rebounds while Lubin scored eight of his 14 points in the fourth quarter. Despite playing in his first varsity game, Aquino wasn’t afraid to get gritty in the paint. Aquino took advantage of his opportunities, getting his first double-double of his career; 10 points, 13 rebounds, and also four blocks. “It was a tight game throughout,” said Washingtonville coach Todd Rose. “They (New Paltz) came out in a great full-court defense in the second half and it took us a little while to adjust to it and find great looks down the court. Senior guard Axel Rodriguez led both teams with 15 points and Casey Burke added 14. Aquino also talked about the strength of the Wizards, adding how they’ll never be an easy team to beat. Note: Coaches from Utica, SUNY Oneonta & SUNY Cortland were in attendance to watch Washingtonville F Kareem Lubin & New Paltz G Casey Burke.